HEARTS today vowed to keep ball boys at games against Celtic despite another schoolboy being injured by a coin thrown from the crowd during the high-pressure clash. The latest incident saw a 13-year-old struck in the lower back about 30 minutes before full-time, prompting Tynecastle security to withdraw all ball boys and girls from the area as tensions mounted. Police have launched an investigation but it is understood CCTV footage of the incident was “inconclusive” and it is not known which set of supporters was responsible. Wednesday night’s incident, which saw paramedics treat the boy for a minor injury, is the latest in a string of ugly incidents during games against the Glasgow club. It comes less than a year after Hearts supporter John Wilson ran on to the pitch at Tynecastle and lunged at Celtic manager Neil Lennon. During that same match, a 14-year-old ball boy was reported to have been hit by a 2p coin. And in October the News told how a schoolboy football team was left “shaken and shocked” after being subjected to foul-mouthed abuse from Celtic fans when they took to the Tynecastle pitch. 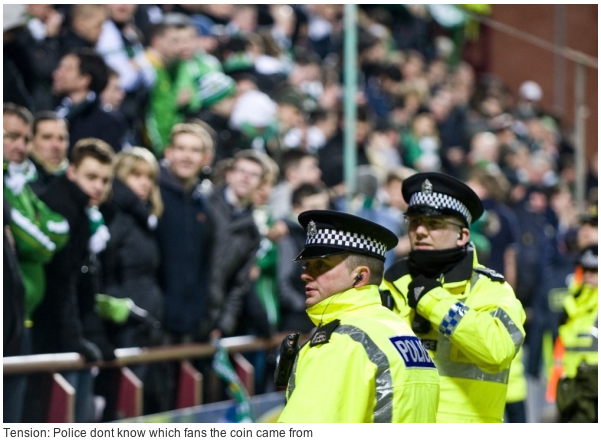 It is understood fans from both clubs had been aiming coins at each other during Celtic’s 4-0 win. Linda More, a Hearts season-ticket holder whose 14-year-old daughter was a ball girl at Wednesday’s match, said there was a “poisonous” atmosphere whenever Celtic visited. “It’s so hostile at these games now and it’s kids who have got caught in the crossfire,” she said. “My daughter said there were coins being thrown and that they were told to leave the pitch and go into the main stand for their safety. It seems like in each game we play now there’s some sort of incident. Gorgie Councillor and Hearts supporter Eric Milligan said: “Last season there was a very bad edge at the Hearts games against Celtic and it has led to things that shouldn’t have happened. A Hearts spokesman said: “There was a ball boy struck by a missile and he was examined by the medical people, but no further treatment was required. “The ball boys and girls were removed as a matter of precaution. Celtic FC said they had not been informed about the incident, but it is understood that they would co-operate with Hearts and the police if necessary. Meanwhile, a 42-year-old man has been charged with a breach of the peace aggravated by religious prejudice during the game and is due to appear at Edinburgh Sheriff Court at a later date.